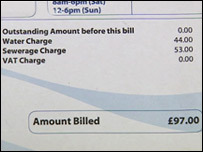 Water bills due to be posted out on Tuesday have been put on hold following the news that power-sharing will return to Northern Ireland. Secretary of State Peter Hain said the move had been made at the request of the DUP and Sinn Fein. The executive will deal with the issue when devolution is restored on 8 May. The parties have now asked for further talks with Gordon Brown. News of the postponement came after trade unions protested against water bills. Nipsa's general secretary John Corey addressed the demonstration at Stormont, on Monday saying the campaign for non-payment of water charges applied "with equal force" to direct rule ministers or to a devolved administration. "For the last four years we have listened to direct rule ministers insisting there is no alternative to household water charges," he said. "Now the secretary of state says water charges can be suspended - or even abolished by the assembly. "Why would anyone pay charges that the government is prepared to switch on and off and use as a political football? "This confirms the nonsense and the unfairness of these charges in Northern Ireland." The new charging system, linked to the value of homes, was due to start in April. The system - to be phased in over three years - was being introduced because the government wanted water and sewerage services in Northern Ireland to become self-financing. But the decision proved highly controversial - with critics arguing that the government had not justified the soaring bills. 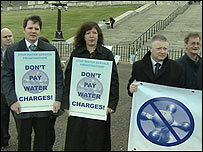 Gary Mulcahy, secretary of the We Won't Pay Campaign, said news that water bills would not be delivered this week was another "humiliating climbdown for the government and a welcome relief for householders". "The threat of mass non-payment of water charges has forced the DUP and Sinn Fein to negotiate the delaying of the charges," he said. "But this does not go far enough. The charges should be completely scrapped, not just delayed for another 12 months. As long as the threat of water charges looms, so will the threat of mass non-payment. "The We Won't Pay Campaign will not shy away from organising mass non-payment of water charges if they are introduced, in any form, by the assembly." 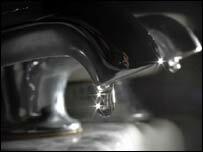 On its website, the Department of Regional Development said that £3bn was needed for water and sewerage services in the 20 years to 2023. "A Northern Ireland Executive could decide to reverse the policy on water charges," it said. "But if it did it would have to decide how to sustain current levels of investment without cutting back on other public services such as health or education. "This would be made extremely difficult by the loss of the Treasury concession on Water Service capital costs which is dependent on self-financing status being obtained. "This concession is worth tens of millions of pounds over the next 20 years."